So after a month now of self-studying ASL at home through two different websites (Lifeprint.com and StartASL.com), and building up a decent but not impressive vocabulary list (around 700 terms at this point, plus I can fingerspell at a rate of around two letters per second), the time finally came last night for me to go out into the world and interact with other signers for the very first time. 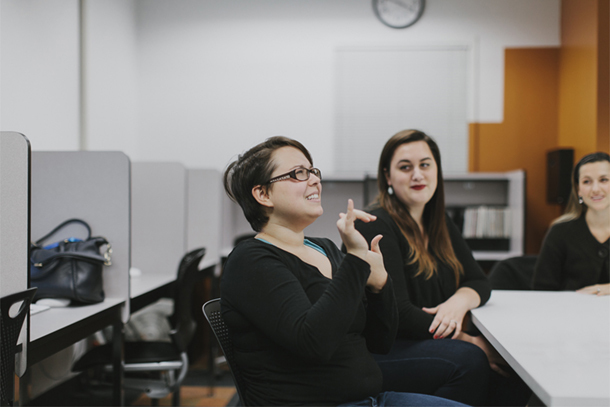 And that's because it was time for the ASL Institute, a six-week series of conversation workshops sponsored by Columbia College here in Chicago, and taught by their award-winning Deaf Studies faculty as part of their nationally admired academic program. That's an important thing to understand about sign language, that like any foreign language, the key to becoming conversational is to throw yourself into actual conversations with actual humans as much as possible; so while I've been happy to discover that you can actually get a fairly decent education on ASL just through solo home study alone, I knew there would be something missing if I didn't challenge myself to get out into the real world as much as possible too, which is why I signed up for these workshops. Plus, as regular readers know, the whole goal of me learning ASL in the first place is not as some academic experiment, but because I plan on transitioning my social life into the Deaf community more and more as I get older, and continue losing more and more of my hearing; so I figured that a fairly safe way of gently entering this community would be by starting with people who professionally teach the hearing how to sign in the first place, and becoming friends with those people first before then slowly branching out into the city at large. And now add to this the special situation when it comes to the Deaf community and ASL, which for those who don't know was a language that was quite literally outlawed among most Deaf schools all the way from the 1880s to 1980s, when a noble but heartbreakingly misguided competing theory about language called “oralism” instead became the new norm. Championed most notably by telephone inventor Alexander Graham Bell (spoiler alert: don't bring up his name at a party full of Deaf people), and aggressively pushed by the same repressive Victorian Christians who also banned Welsh in the same time period, it was basically a two-pronged attack against sign language: the first argument being that it's better for the deaf to learn how to speak and read lips, because this helps them integrate back into “normal” society better than learning their own special language that no hearing person understands; and the second argument being that ASL is not actually a language at all, but rather a series of crude pantomimes that is unable to express abstract concepts like the future and past or philosophical thoughts, something that will never be able to hold a candle to the rich and sophisticated possibilities of English. And this is not to mention (the Christian oralists argued) that ASL is an abomination against God, since the Bible clearly states that the difference between humans and animals is our ability to speak, meaning that any Deaf person who refuses to do so is essentially spitting in God's face. But there's one big problem with all this, which is that oralism simply doesn't work, or at least not the way that oralists used to claim that it does; for while functionally Deaf people with some hearing can eventually after years of intense study come to speak and lip-read fairly well, a century of scholarly studies has proven over and over that even in the best-case scenario, the most adept lip-readers still only catch about 30 percent of a hearing person's conversation, the rest basically guessed at through context, gestures and facial expressions. And that's best case; for most people who can't hear, reading lips is a complete disaster that never works, which then in the repressive 20th century got these people labeled by their hearing caretakers as mentally challenged, and relegated to remedial classes and then factory or farm work for the rest of their life. This is how we got the outdated and now shameful term “deaf and dumb,” because for a long time it was just assumed by the hearing world that most people who were deaf were also “mentally retarded” (another outdated term I'm deliberately using here to prove a point about its awfulness), and that the few who thrived at oralism were the rare genius exceptions that proved the rule. My instructor for the next six weeks is A., who surprisingly turns out to be a graduate of the prestigious Gallaudet University, a school with a fascinating history: first authorized by Abraham Lincoln during the Civil War in the 1860s, to this day it still remains the one and only accredited four-year liberal-arts college in the US to cater exclusively to Deaf students, and it was the 1988 student protests there over the lack of a Deaf president that kickstarted the modern Deaf Pride movement, “Stonewall”-style, which makes me feel lucky to have an instructor who comes out of that environment. But man, am I glad I decided to start studying ASL on my own for a month before showing up, because she just threw us into the heat of things with no warning — after repeating the fingerspelling alphabet just three times, she was already spelling out entire words in class and expecting us to comprehend, and literally covered close to 50 ASL terms in two hours, which would've had me dumbfounded if I hadn't already practiced most of them at home over and over and over for the last four weeks. This is something I first learned when attending a computer coding bootcamp back in 2015, neither a good nor bad thing on its own but simply an objective fact that exists — that in late middle-age, my brain simply can no longer operate at the same speed as someone in their twenties (the age group that constitutes most of the other 30 people in my workshop, who seem to mostly be undergraduates taking this evening course for extra credit), and that I have to work harder and longer than everyone else if I expect to keep up at their pace. And in this I take inspiration from the Deaf community itself, as often expressed in the Disney Family television show Switched at Birth I became an obsessive fan of earlier this year (but see my blog entry specifically on that subject for more); how at one point in the show's run, the main Deaf character Daphne decides to major in pre-med at college, gets frustrated by a series of hurdles that develop around her (technical terms with no equivalent signs, surgeons wearing masks that cover their lips, doctors who dismissively scoff at the very idea of her interning for them), and is reminded by her peers and family that if she wants to do something ambitious like that, she simply has to work harder at it than hearing people, and that there's no point whining about it because complaining won't change the situation. It's a powerful example of why Deaf people hate being referred to in victim terms like “disabled” or “handicapped;” they don't see themselves that way, no more than we would consider a person with high blood pressure to be “disabled,” but rather as someone with a bodily imperfection that can be easily compensated for through intelligence (less salt), discipline (daily exercise), and community involvement (convincing restaurants to offer heart-healthy menu items). I'm what's known in the community as a “late-deafened adult” (LDA) in that I grew up as a hearing person, think in the word order and grammar of English, and see my hearing loss as something “being taken away from me,” with all the resulting emotional grieving that that statement implies. In addition to studying the Deaf community, I've been doing a little bit of studying about the LDA community in the last month too, and have quickly come to learn that most late-deafened adults never successfully learn ASL or transition into the Deaf community; they simply count out the clock in their old age within a world that becomes increasingly narrower and lonelier, unable to make new friends and with it increasingly difficult to communicate with their old ones. I'm determined that this will not be my fate, because the very thought depresses me to a point of despair; but that means I simply have to want it more than the people around me, have to put in the extra work, have to put in the extra time, have to practice four hours a day like I've been doing this month, have to burn through a book every day or two like I've been doing this month. “Oh, you're welcome,” A. replied. “Yes,” I confirmed. “I have a hearing aid, but my hearing is decreasing each year. This ear” — I pointed to the left one — “surgery, year 2000. This ear” — pointing to the right — “Too much music when younger.” I paused, then spelled out “P-U-N-K,” and we both laughed. “Later,” she showed me in sign. And there it was — the first-ever ASL conversation I've had in my life. And I have to admit, it felt like freaking magic, like I was a Hogwarts student and had just successfully performed an Expelliarmus spell for the very first time. The moment I got done with my first-ever ASL conversation, the thing I most wanted to do was immediately have another ASL conversation, which made me profoundly appreciate the stories in these Deaf culture books I've been reading this month (especially the ones written in the 1970s and '80s), relaying the stories of Deaf kids who grew up without knowing that ASL even existed, and how they went through a lightning-fast explosion of intellectual curiosity the moment as adolescents that they learned how to sign. That's simultaneously the most heartbreaking and the most uplifting thing of all about the shameful history of forced oralism in the 20th century; when so-called “dumb,” so-called “retarded” Deaf kids were finally allowed to learn ASL, most of them blossomed within literally months from a remedial learning level to above-average, yet this wasn't seen by their hearing caretakers as proof that everyone should learn sign, but rather they were considered “rare miracles” that merely proved that not every single deaf person was fated to be a janitor or a maid. At the age of 50, I'm starting to get a taste of what this so-called “miracle” must've felt like; and I have to admit, I want more. EXPECTO PATRONUS!